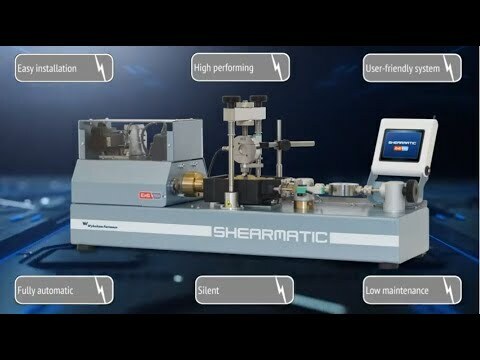 Shearmatic EmS is a standalone automatic machine with Electromechanic Servoactuation for direct/residual shear testing. It can also automatically perform the oedometric consolidation tests using the dedicated accessories. It incorporates two high-resolution stepper motors with high precision transmissions. It features a closed loop PID control optimized for automatic test performance at the touch of a button, dead weights and air compressor are no more necessary. The user interface is based on a large 6” touchscreen colour display permitting to start, pause and stop the test, to choose the data recording mode, to show the readings during the test execution and to carry out the transducers calibration. The axial transmission of the horizontal force is accurately ensured by a straight connection between shear box, shaft and load cell. This design avoids the load measurement inaccuracies occurring with the widely used “swan neck” basic design. The digital controller reads and processes the vertical and horizontal forces and displacement readings and drives the motor accordingly for the proper automatic test execution under closed loop PID control. In addition, a dedicated software (to be ordered separately) allows the remote control from a PC of multiple Shearmatic Ems machines. When the remote control mode is used, the PC software becomes the user interface and manages the main functions as well as the channels calibration by linear, polynomial and multi-coefficient curves. The Shear box assemblies have to be selected and ordered separately.